One of the things that I love about Agile Software Development is how some practices have large, immediate impact on the project when you want to improve or change something. This is exactly what makes Agile so exciting, effective and dynamic—it’s responsive so it cuts costs and adds value all the time as long as it’s implemented correctly. Weekly Backlog refinement is one of the practices that delivers high-impact improvement in a short time frame. This means that if you’re struggling or the team is having problems, one method to ease difficulty could be through backlog refinement. 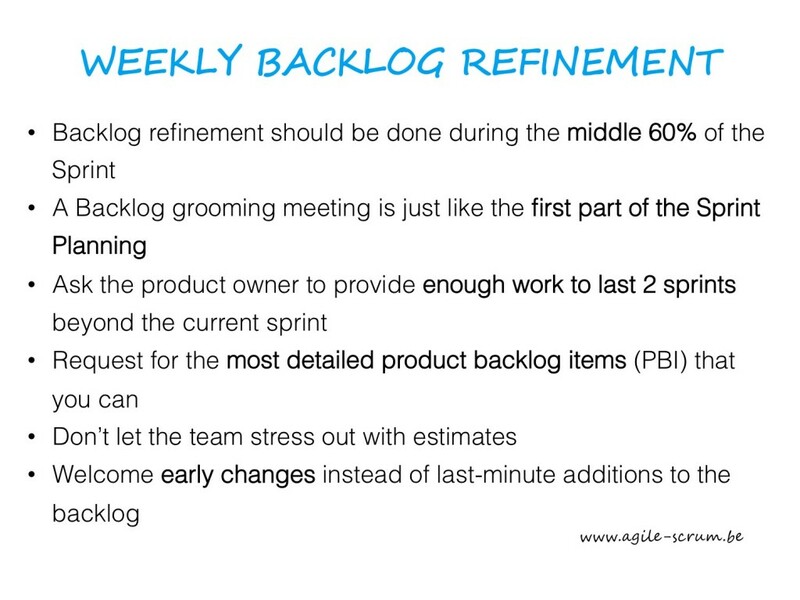 Backlog refinement should be done during the middle 60% of the Sprint. Why? The first 20% of the Sprint should be for establishing the pace and to let everyone get some progress in. The last 20% of the Sprint could be the time when they’re focusing on the remaining items on the Burndown Chart. Grooming during the last 20% disrupts the momentum and may result in a failed Sprint. A Backlog grooming meeting is just like the first part of the Sprint Planning Meeting. Talk about the User Stories again and how to prioritize them. User story conversations are so important because these develop into tasks and items that are concrete parts of the backlog. When you whittle these down or refine them, you improve workflow and correct mistakes. Ask the product owner to provide enough work to last 2 sprints beyond the current sprint. Determining the work to be done is relative to the team. If you’re very lucky to have a highly-skilled team, they can go through the work lightning fast. You won’t know the pace of the team until the first sprint. So if the weekly backlog refinement means adding more of the extra items, then lucky you! Request for the most detailed product backlog items (PBI) that you can. The worst thing that a PO can give you is a draft of a User Story that hasn’t been discussed with the team and the stakeholders. The story hasn’t been tested and can disrupt work. It’s important that you always get a good detailed acceptance test for each item. Don’t let the team stress out with estimates. Always keep in mind and inform the team that the estimates aren’t final until they’ve been added to the Sprint backlog as an actual item. If the team feels nervous about the estimates, there is still a lot of time between the backlog grooming and Sprint Planning meeting to re-estimate. Welcome early changes instead of last-minute additions to the backlog. You want backlog refinement to happen at the start of Sprints, not towards the end. Instead of being frustrated with the changes, be thankful they happen early so the team isn’t interrupted and the workload is as static as it can be during the sprint. Good Product Backlog refinement is hard to do since it’s a practice that can be done at any time but should not be done with impunity. The most skilled Scrum Masters and project managers know how to use this tool to save a failing Sprint—I hope you can be as skilled as that too.